A few emails ago I mentioned where the San Mateo/Santa Cruz county line was on the coast. It’s located below the Waddell Bluffs, where Highway 1 descends toward Waddell Creek, about a hundred and fifty yards or so north of Alligator Rock. Nowadays because of the steepness of the cliffs below Highway 1, and the private ownership of the coastal land, Alligator Rock is the only place (and accessible only by climbing down over large boulders) that the public can reach the beach, and from there to Ano Nuevo State Park. That makes this route the easiest way to touch the sands of San Mateo County’s most southerly beach. It’s also the site of “Cape Horn,” as it was dubbed, whose unstable, prone-to-continual-landslide soil, combined with the crashing waves, often threatened safe passage for those traveling the coast at the turn of the 19th Century. I’ve attached a photo of Alligator Rock from close to sea level that shows Ano Nuevo Island in the background. From Highway 1, particularly during high tides, the curved rock jutting into the ocean looks remarkably similar to a partly submerged alligator when viewed from the bluff above. A state worker, dumping the landslide material from the east side of Highway 1 over the cliff on the west side of the road, told me that was its name, but I can’t find online or other confirmation. Is this name familiar to you? Did Hank Bradley patrol this far south? Did he have a name for this beach? In Harvey Mowry‘s book there are two pictures of what this area looked like at the turn of the century. I’ve attached a scan of one of them. 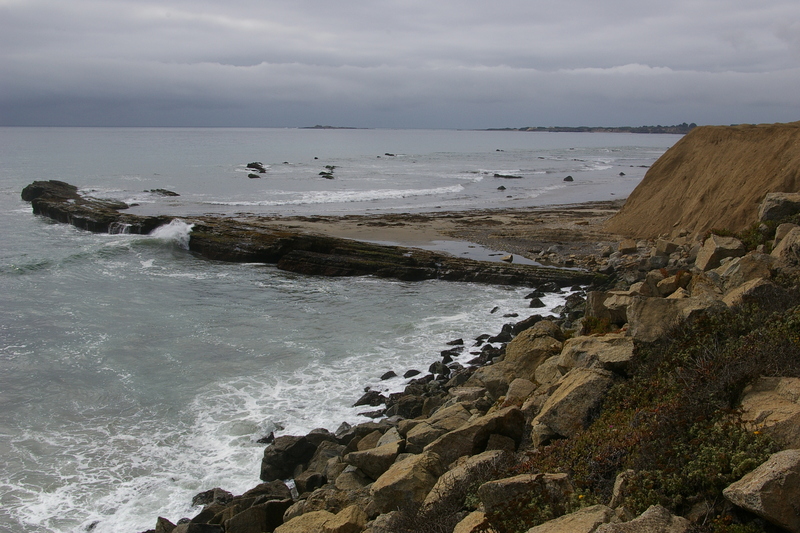 As you can see not much has changed as far as the location of the shore, especially when compared to the spectacular erosion of the shoreline north of Ano Nuevo you mentioned. I suspect until all of the Waddell Bluffs erodes into the ocean the shoreline will remain just about where it is at this southerly entrance to San Mateo County. Here’s an excerpt from Harvey’s book about this area. “During the early 1900s the high, bald-faced cliffs of Waddell Canyon’s north wall terminated abruptly at sea edge and effectively barred north and south traffic except at low tide. The barrier could only be by-passed over about a three-quarter mile stretch of risky beach travel. 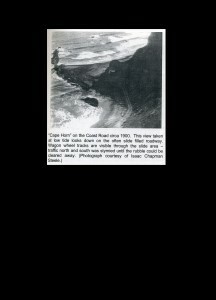 Teamsters had dubbed one particularly hazardous rocky spit as “Cape Horn,” no doubt suggesting passage at that point likened to surmounting the dangers of Caape Horn. “That obstacle was encountered about halfway between entering and leaving the beach route. Teamsters had to frequently pick and shovel through the rubble deposited by the unstable cliffs.”….